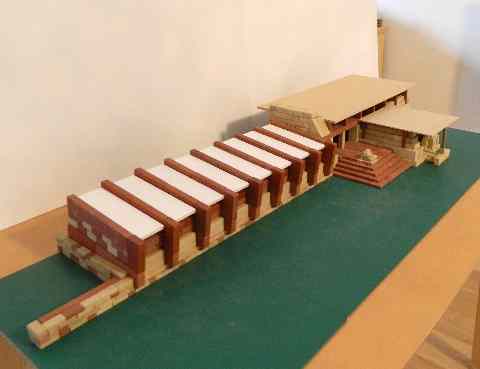 AV Robert Palmer, Weston Favell, Northampton, England, sent me his reproduction of Taliesin West, designed in 1937 by Frank Lloyd Wright. It is in the Prairie Style, a style which is perfect for Anker. As usual, more pictures can be found on the builder's page. The last CVA meeting was held on Saturday, Octoberl 19, 2013; Hotel Lapershoek in Hilversum, Netherlands. The next CVA meeting: Saturday, April 26, 2014. The last CVA meeting was on Saturday, April 6, 2013. The next meeting date will be on Saturday, October 19, 2013. See the CVA page for details on the CVA. The Club of Anker Friends (CVA) has published a Stone Catalog. The new printing has been done, and the catalogs have been sent to CVA members. There is already a list of pages being revised. Not major omissions, but changes worth making. This catalog is available only to CVA members. The new Anker factory in Rudolstadt, Germany has added many new designs to its web site (thanks to the help of the CVA BiK committee and the late Burkhardt Schulz). They can be easily downloaded, as they are PDF files. For the month of February, 2014.